Obitus is a computer game by Psygnosis, released in early 1991 for Amiga, Atari ST and DOS systems. It was also ported for the Super NES, by Bullet-Proof Software. The player takes on the role of medieval history lecturer Wil Mason, whose car breaks down while he drives through Snowdonia in a storm. He seeks refuge in a deserted tower, only to wake up in a strange world. 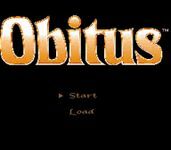 Obitus is essentially a computer role-playing game, but with some arcade-style action as well. It combines several graphics styles and perspectives. Reviewer David Upchurch gave the Amiga version a score of 830 (out of a possible 1000), praising the graphics and gameplay, but noting that it may not appeal to hard-core RPG enthusiasts. Source: Wikipedia, Obitus , available under the CC-BY-SA License.